When we first moved into our three bedroom home here in West Palm Beach, it made sense to have my "studio" in our third bedroom. Then, before I started working for myself full time, it was basically somewhere to put my computer and plants. After really focusing on growing my product selection the past year, my greeting cards and inventory started quickly spilling from just one room into the rest of our house. With a little [loving] push from Jordan, I started to look at spaces in the area. After a few options fell through, I found what I consider a perfect little spot for my business just ten minutes from our home. I love it so much! It's been so nice having a little more separation between work and home -- it's easy for the line to blur and feel like you have to constantly be working if your office is at home, or get distracted from work when family's in town or something else is going on at the house. Anyyywho...a small business often means a smaller budget for projects like this, so as always I've tried to get a pulled together look for less. Sourcing pieces from more affordable sources like HomeGoods and Wayfair, Target and World Market, all helps to keep cost low. I always like to support fellow small business owners, so a few of the decor items are from some of my favorite shops as well. To mimic my nature inspired brand, the colors in my designs are also reflected in the furniture pieces I've picked. It was fun to get a little more funky with the green velvet couch for the shop than I might for our home, too. Pops of pale peach, natural wood, and lots of greenery also tie into my product color palette. Bit by bit it's coming together, and this loungey studio space is the furthest along in the shop for now. The little kitchenette area is still a mishmash of random cabinets but it'll get there! So, have you heard of design goddess Sarah Sherman Samuel? If not, look her up RIGHT NOW, I'll wait. Her modern California style is what my dreams are made of, and she's a constant source of style inspiration. We also have a mutual friend in California and I almost got to meet her at an event once. So we're basically best friends now. Like this room she designed, I definitely want to make our bedroom fresh and bright with white walls and light bedding. Maybe I'm a little crazy for wanting white bedding with three large dogs that love jumping up on the bed, but the heart wants what the heart wants. And, we have a great washing machine. So there. I've also always loved this bedroom -- clean, bright, warm wood tones, and lots of greenery. Just what I have in mind for our home. Our master bedroom is the first I've ever made a mood board for, and it helped me so much with maintaining FOCUS and figuring out what looked good together before bringing pieces home. I love discount stores like HomeGoods and TJMaxx, but I'm guilty of seeing something I like and grabbing it without having a specific place to put it, and then it ends up floating around our house like a decor nomad. 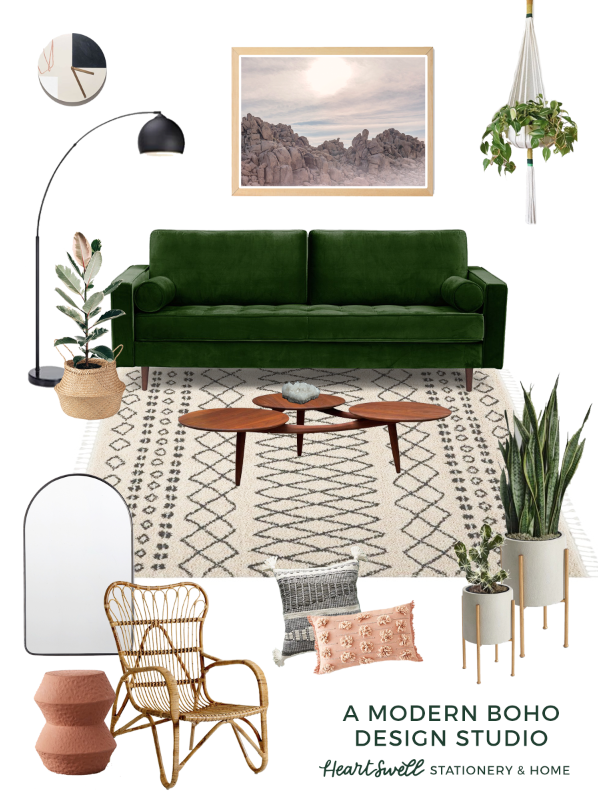 Making a design board really helped me keep the overall design in mind when shopping, and it gave me patience to find the right (or very similar) pieces for the space instead of just quickly buying a bunch of stuff at once from a discount store. Side note, here's the deal. I'd love to buy authentic kilim or Turkish rugs, but they cost an arm and a leg, and with our three dogs I mentioned above, our rugs get a TON of traffic. Expensive rugs are just not something I'm willing to invest in. Our home isn't huge so we don't have unused rooms that we can have expensive rugs in. There are twelve paws and dog hair and sand, (and we just added water to the mix from our new pool!) so, yeah. Amazon rugs that look like Turkish rugs it is. And you know what? I'm 100% fine with that. It fits OUR lifestyle -- I think that's always something to remember when designing your space. Design your home so that it works for YOU, not what someone else tells you is right. Even if you don't have photoshop to assemble a mood board, it's easy to create an inspiration board on Pinterest or even just a folder of images on your computer or phone!